We know, geography isn't everyone's strength. If you're not sure where Warth is situated, don't forget to brush up on its location before you take off! If you need help getting your bearings, Vienna, the national capital, is 300 miles (483 kilometers) to the east. Also, Oberstdorf is 9 miles (14 kilometers) to the northeast. Get an amazing bargain on your adventure to Warth by combining your flight and accommodation bookings. You can also pick from upwards of 400 airlines and 665,000 places to stay. Are you looking for a panic-free getaway experience? Our Customer 1st Guarantee offers the security of 24/7 personal assistance on our services. If you happen to find a better deal on another website, we will return the difference^. With no hidden fees or charges from us, you needn't worry about changing your vacation plans. And so long as you get in quick, most accommodations don't charge extra fees either^. Few things are as satisfying as sliding into bed after a huge day of exploring. 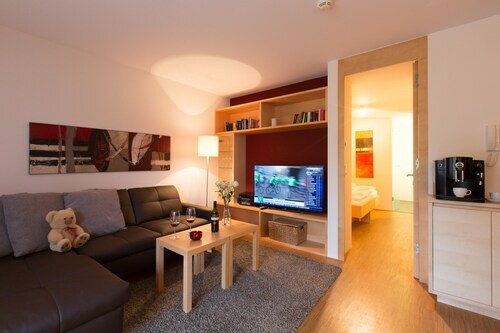 With an impressive 40 accommodations in Warth, you can have your pick of the cushiest of them. When you've got all those unforgettable vacation experiences to organize, who wants to waste time scouring the web for a place to stay? Don't worry, we've done the hard work for you already. 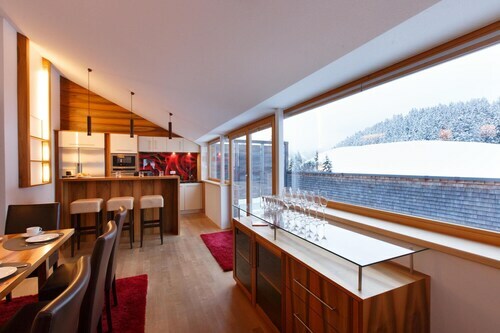 The Hotel Tannbergerhof and Kristiania Lech are a couple of our favorite properties in the region. Where do you fly into for Warth? 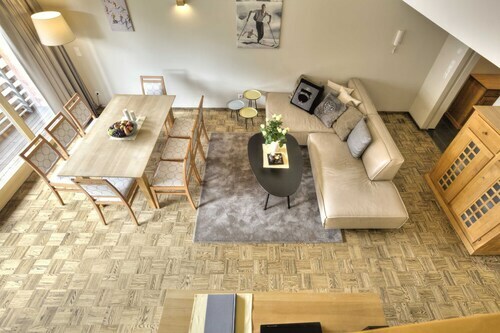 While you're brainstorming for your Warth getaway, bear in mind that the nearest airport, St. Gallen - Altenrhein Airport (ACH), is approximately 35 miles (56 kilometers) northwest of the main streets. Book your flights, fill up your suitcase and get ready for some exciting new adventures! Can I rent a car in Warth? Wander the streets in Warth and experience the distinct culture. If you want to head further out, getting a rental car via Travelocity is a great choice. Take your getaway to dazzling new heights with a trip up Mittagspitze. On your way to the top, remember to stop and enjoy the splendid views. Want more options? Whether you're a whiz on the snow or a novice, it's time to take out your skis and enjoy the slopes. Warth Schrocken Ski Resort promises heaps of fun for all skill levels! Warth is just 35 miles (56 kilometers) from Fuessen. Use this place to access a range of attractions, including Neuschwanstein Castle and Hohenschwangau Castle. If you have the time, head just 45 miles (72 kilometers) to Ettaler Forst. This is another part of the region with nearby amazing attractions like Ettal Abbey and Linderhof Palace. Located in the mountains, this ski-in/ski-out hotel in Warth is within 20 mi (32 km) of Church of Our Lady of the Assumption and Valluga and close to winter sports such as snowshoeing and sledding. Located near the slopes, this Warth hotel is in the mountains, within 6 mi (10 km) of Mittagspitze and Warth Schrocken Ski Resort, and close to winter sports such as cross-country skiing and skiing lessons. Holzgau Heritage Museum and Church of Our Lady of the Assumption are also within 12 mi (20 km). 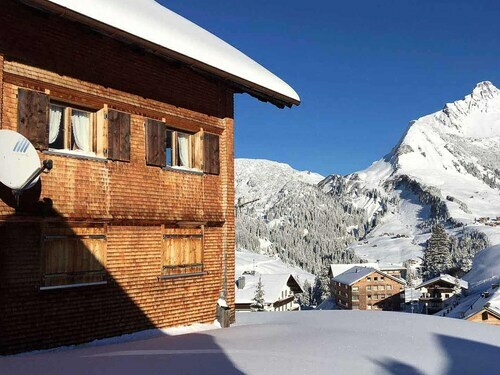 Offering ski-in/ski-out access, this hotel in Warth is in the mountains, 2.8 mi (4.5 km) from Warth Schrocken Ski Resort, and close to winter activities such as cross-country skiing and snowshoeing. Diedamskopf Ski Resort and Mittagspitze are also within 12 mi (20 km). 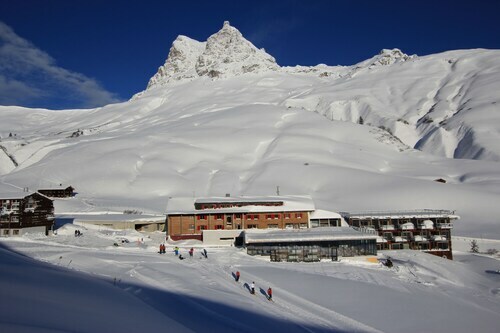 Offering ski-in/ski-out access, this hotel in Warth is in the mountains, 0.5 mi (0.8 km) from Warth Schrocken Ski Resort, and close to winter activities such as cross-country skiing and skiing lessons. Diedamskopf Ski Resort and Mittagspitze are also within 12 mi (20 km). Situated in the mountains, this romantic vacation home is 0.7 mi (1.1 km) from Mittagspitze and within 12 mi (20 km) of Warth Schrocken Ski Resort and Holzgau Heritage Museum. Church of Our Lady of the Assumption is 9.5 mi (15.3 km) away. Located in the heart of Warth, this resort is 0.6 mi (1 km) from Mittagspitze and within 12 mi (20 km) of Warth Schrocken Ski Resort and Holzgau Heritage Museum. Church of Our Lady of the Assumption is 9.5 mi (15.3 km) away. Situated in the mountains, this resort is 3.2 mi (5.1 km) from Warth Schrocken Ski Resort and within 12 mi (20 km) of Holzgau Heritage Museum and Church of Our Lady of the Assumption. Diedamskopf Ski Resort is 12.8 mi (20.7 km) away. 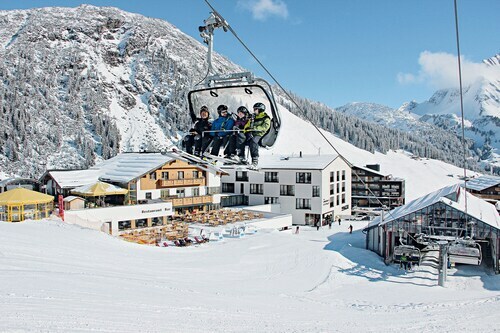 This family-friendly Warth resort is located on the waterfront, 0.7 mi (1.1 km) from Mittagspitze, and within 12 mi (20 km) of Warth Schrocken Ski Resort and Holzgau Heritage Museum. Church of Our Lady of the Assumption is 9.6 mi (15.4 km) away.